Boston Acoustics launches new TVee Model 20 soundbar | What Hi-Fi? Here's another offering to add to the list. We weren't overly enamoured with the original TVee but hopefully the new TVee Model 20 from Boston Acoustics will fare better. 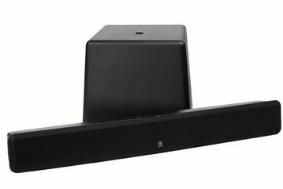 It's certainly affordable, costing just under £300 for a slim main unit and a wireless sub with a 6in driver. Finished in gloss black, it's aimed at TVs measuring 32in and above. Boston Acoustics' new HHRT (Hyperbolic High Rigidity Transducer) driver technology aims to deliver improved sonic performance compared to the older model. Connecting straight to your TV via the standard RCA audio outputs, the sysem delivers a total power output of 100 watts. Also integrated to the machine is the Boston's remote learning function, which allows your existing remote to control the TVee's volume and mute functions. The Boston Acoustics TVee Model 20 is set to go on sale in April for £299.90.